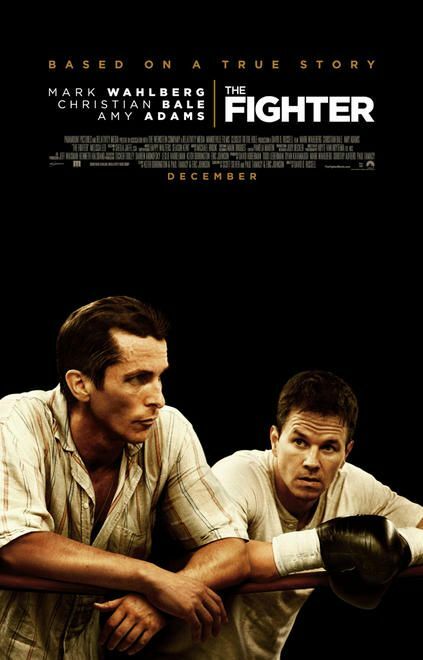 Simply put, The Fighter is a great film. It is easily in the discussion for one of the best boxing movies of all time, but not quite on the level of Raging Bull and Rocky. Let’s put it this way, if Christian Bale was the actual fighter, he might have pushed it over the top. His performance as Dicky Eklund, the troubled drug-addict half-brother of Mickey Ward (Wahlberg) is one of the best in a long time. While he gets a nod for Best Supporting Actor, I strongly feel that he carried this movie. The film is as much about him and his impact on Ward as “The Fighter” himself. If you happen to think Bale’s performance may have been a little over the top, then I suggest you stay for the credits and watch the 20 seconds with the real Dicky Eklund. You may find yourself picturing Christian Bale every time you think of Eklund in the future, much like I have an ingraned image of Val Kilmer in place of Jim Morrison’s mug shot. If you’ve been reading these reviews, and judging by the attendance you haven’t (sorry I couldn’t resist the chance for a Bob Euker reference), you might know that The Movie Mind has taken a few recent shots at “Marky Mark” and his limited acting chops. I hope it’s not construed as being a hater, but I just call it as I see ‘em. Much like fellow Bostonian Ben Affleck, he has an extremely miniscule “range” of roles that he should ever be cast for. A cop from Boston, wiseguy punk from Boston, and a boxer from Boston are all well within his acting chops. Anything outside of that, well just watcheither of their finest artistic showings in Gigli or Shooter and feel free to come to your own conclusions. So while I can admit that Marky Mark made a solid showing as Mickey Ward, I can also tell you that playing opposite Bale and Amy Adams in every scene really illuminates his lower-tier status. So he may have been decent or even good, but his performance was one of the reasons this movie is “only” great, as opposed to simply the best. Watch the film and tell me his brother Donnie Wahlberg wouldn’t have made a better Mickey Ward. He looks more like the real thing and I also think he has a little more ability in the acting department. Mark Wahlberg was the safe pick, but making a more difficult choice for the role would have paid off tenfold. The beauty of this film is that regardless of whether or not you have heard of Mickey Ward, or seen one of his fights…hell, even if you’ve never seen a boxing match before, you will undoubtedly enjoy this film. Somehow the writers and director David Russell manage to tell a compelling story using an unheralded figure in the public eye while actually leaving out the moment that truly made him famous. The fact that the film ends before Ward’s epic battles with Gatti just go to show that this movie was about the relationships Ward had with those around him and how they shaped him into the fighter and person he was. When you mix in an authentic feel for the surroundings and characters portrayed in a way not seen since Gone Baby Gone, you come up with a true gem like the one I just witnessed. Interesting Cameo Appearance: The legitimate Bostonian, Jack McGee (better known as Chief Jerry Reilly from the phenomenal TV drama, Rescue Me) as George Ward, Mickey’s pop and biggest supporter. Dickie Eklund: Do you think I knocked down Sugar Ray Leonard? Mickey Ward: Yeah, sure I do. You were the pride of Lowell. You were my hero, Dicky. Dickie Eklund: I was. I was. Wolfie: Hey, we don’t hate Cambodians. White people do this to other white people all the time. Mickey Ward: I’m not a stepping stone anymore. Mickey Ward: That guy did not just get off the f*ckin’ couch. If he did, I’m gonna get a couch like that.